This article is about the economic parable. For the criminological theory, see Broken windows theory. When a child accidentally smashes a window, and then it has to be replaced, does this accident constitute a benefit to society, due to the economic activity of repairing and replacing the window? The parable of the broken window was introduced by French economist Frédéric Bastiat in his 1850 essay "Ce qu'on voit et ce qu'on ne voit pas" ("That Which We See and That Which We Do Not See") to illustrate why destruction, and the money spent to recover from destruction, is not actually a net benefit to society. The parable seeks to show how opportunity costs, as well as the law of unintended consequences, affect economic activity in ways that are unseen or ignored. 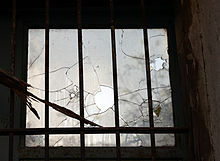 The belief that destruction is good for the economy is consequently known as the broken window fallacy or glazier's fallacy. Have you ever witnessed the anger of the good shopkeeper, James Goodfellow, when his careless son has happened to break a pane of glass? If you have been present at such a scene, you will most assuredly bear witness to the fact that every one of the spectators, were there even thirty of them, by common consent apparently, offered the unfortunate owner this invariable consolation – "It is an ill wind that blows nobody good. Everybody must live, and what would become of the glaziers if panes of glass were never broken?" Austrian School theorists, and Bastiat himself, apply the parable of the broken window in a different way. Suppose it was discovered that the little boy was actually hired by the glazier, and paid a franc for every window he broke. Suddenly the same act would be regarded as theft: the glazier was breaking windows in order to force people to hire his services. Yet the facts observed by the onlookers remain true: the glazier benefits from the business at the expense of the baker, the tailor, and so on. Whence we arrive at this unexpected conclusion: "Society loses the value of things which are uselessly destroyed;" and we must assent to a maxim which will make the hair of protectionists stand on end – To break, to spoil, to waste, is not to encourage national labour; or, more briefly, "destruction is not profit." What will you say, Moniteur Industriel – what will you say, disciples of good M. F. Chamans, who has calculated with so much precision how much trade would gain by the burning of Paris, from the number of houses it would be necessary to rebuild? Bastiat is not addressing production – he is addressing the stock of wealth. In other words, Bastiat does not merely look at the immediate but at the longer effects of breaking the window. Moreover, Bastiat does not take into account only the consequences of breaking the window for one group but for all groups, for society as a whole. Austrian theorists cite this fallacy, saying it is a common element of popular thinking (e.g., the "Cash for Clunkers" program, etc.). The 20th century American economist Henry Hazlitt devoted a chapter to it in his book Economics in One Lesson. The broken-window scenario is used as an analogy for destruction by natural disasters. Disasters disrupt economic activity. The economic effects of natural disasters are varied. Firefighters at work in the Taisho-suji Market in Kobe, Japan after a 1995 earthquake. Countries are more likely to have GDP fall after a disaster if they have more unemployment, more poverty, less effective local and national governments and institutions, and weaker economic and diplomatic connections. Countries are more likely to have a GDP boost and recover quickly from a disaster if they retain a skilled workforce and the ability to mobilize resources for reconstruction, including resources from outside the disaster area. On the one hand, prompt recovery has been attributed to prompt insurance and aid payments, with the contrast between Hurricane Andrew and Hurricane Katrina as an anecdotal example. On the other hand, slow recovery has been blamed on predatory behaviour, with those unharmed or less-harmed by the disaster taking advantage of those more harmed. Areas that have had repeated disasters tend to invest more in skills and education (possibly because this is preferred to riskier investment in infrastructure, which might be destroyed again), and they tend to have a higher total factor productivity (possibly also because infrastructure destroyed in disasters is replaced with better infrastructure, as, for instance, in the Great Fire of London). These tendencies could in theory lead to longer-term economic benefits (which may cause GDP growth). There is some evidence that geological disasters do more economic harm than climate-related disasters, in the long term. Geological disasters, such as landslides and earthquakes, happen with little immediate warning and kill many people. Climate-related disasters, such as hurricanes, are more predictable on a scale of days to hours, and kill fewer people. Such warning saves people, but not immovable property. This suggests that killing people does long-lasting economic harm, while destroying capital is not as harmful to GDP growth. Even in disasters with few physical injuries, a large portion of the economic cost may be public health effects (approximately a tenth, in the case of the summer 2007 floods in the UK). The economic costs of disruption to children's education are significant. Mental health issues may be triggered or exacerbated by the distress suffered during the disaster. Health advice on minimizing psychosocial stress has been given for disasters. While public health costs may contribute to economic activity and GDP growth, a growth in demand for medical or educational assistance is unlikely to be seen as beneficial. Partly-cleared bomb damage in an industrial area. The roofless buildings are houses. The corrugated metal in front of the pile of bricks and framing timber is the remains of several air-raid shelters. Occasionally the argument has been made that war is a benefactor to society and that "war is good for the economy." However, this belief is often given as an example of the broken window fallacy. The money spent on the war effort, for example, is money that cannot be spent on food, clothing, health care, or other industries. The stimulus felt in one sector of the economy comes at a direct – but hidden – cost to other sectors. Bastiat himself argued against the claim that hiring men to be soldiers was inherently beneficial to the economy in the second chapter of That Which is Seen, and That Which is Not Seen, "The Disbanding of Troops". 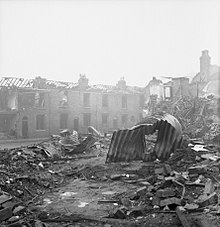 It is never an advantage to have one’s plants destroyed by shells or bombs unless those plants have already become valueless or acquired a negative value by depreciation and obsolescence. ... Plants and equipment cannot be replaced by an individual (or a socialist government) unless he or it has acquired or can acquire the savings, the capital accumulation, to make the replacement. But war destroys accumulated capital. ... Complications should not divert us from recognizing the basic truth that the wanton destruction of anything of real value is always a net loss, a misfortune, or a disaster, and whatever the offsetting considerations in a particular instance, can never be, on net balance, a boon or a blessing. ^ a b Bastiat 1850. ^ Le Moniteur Industriel was a famous protectionist journal. ^ Fetter 1915, chapter 37: "WASTE AND LUXURY". ^ Hazlitt 1946, chapter 2: "The Broken Window". ^ Baum, Caroline (4 August 2009). "Cash for Clunkers Is Just a Broken Windshield". Bloomberg.com. Archived from the original on 26 October 2012. Retrieved 2 March 2017. ^ "Japan and the economics of natural disaster". 16 March 2011 – via The Economist. ^ Burn-Callander, Rebecca (28 December 2015). "UK flooding: cost of damage to top £5bn but many homes and businesses underinsured" – via www.telegraph.co.uk. ^ a b c d Bennett, Drake (July 6, 2008). "How disasters help". The Boston Globe. ^ a b "Special Report: Advanced economies cope better with disasters". 13 March 2011 – via www.reuters.com. ^ "THE BROKEN WINDOW FALLACY: ECONOMICS, INVESTMENT AND DISASTER RISK REDUCTION - ACS-AEC". www.acs-aec.org. ^ a b Skidmore, Mark; Toya, Hideki (October 2002). "Do natural disasters promote long-term growth?". Economic Inquiry. 40 (4): 664–687. doi:10.1093/ei/40.4.664. ISSN 1465-7295. ^ SciDev.Net. "Early warning of disasters: Facts and figures". SciDev.Net. ^ Horwich, George (April 2000). "Economic Lessons of the Kobe Earthquake". Economic Development and Cultural Change. 48 (3): 521–542. doi:10.1086/452609. ^ Stanke, Carla; Murray, Virginia; Amlôt, Richard; Nurse, Jo; Williams, Richard (2012-05-30). "The Effects of Flooding on Mental Health: Outcomes and Recommendations from a Review of the Literature". PLOS Currents Disasters. doi:10.1371/4f9f1fa9c3cae. ISSN 2157-3999. PMC 3461973. Retrieved 2018-02-07. ^ Hazlitt 1946, chapter 3: "The Blessings of Destruction". Bastiat, Frédéric (1850). That Which Is Seen, and That Which Is Not Seen [original French: Ce qu'on voit et ce qu'on ne voit pas]. Translated by Patrick James Stirling – via Wikisource. Fetter, Frank A. (1915). Economic Principles. NEW YORK: THE CENTURY CO.
Abrams, Burton A; Parsons, George R (2009). "Is CARS a Clunker?". The Economists' Voice. 6 (8). doi:10.2202/1553-3832.1638. McGee, Robert W. (2010). "Financial Bailouts and the philosophy of Frédéric Bastiat". Aestimatio (1): 88–97. SSRN 2435748. Stringham, Edward P.; Snow, Nicholas A. (2008). "The broken trailer fallacy: Seeing the unseen effects of government policies in post-Katrina New Orleans". International Journal of Social Economics. 35 (7): 480–89. doi:10.1108/03068290810886885. Carabini, Louis (2007). "Bastiat's 'The Broken Window': A Critique" (PDF). Journal of Libertarian Studies. 21 (4): 151–55. Mian, Atif R.; Sufi, Amir (2010). "The Effects of Fiscal Stimulus: Evidence from the 2009 'Cash for Clunkers' Program". SSRN Electronic Journal. doi:10.2139/ssrn.1670759. Caplan, Bryan; Stringham, Edward (2005). "Mises, bastiat, public opinion, and public choice" (PDF). Review of Political Economy. 17: 79–105. doi:10.1080/0953825042000313825. Stanfield, James (2010). "The Broken University: What is Seen and What is Not Seen in the Uk Higher Education Sector". Economic Affairs. 30 (3): 53–58. doi:10.1111/j.1468-0270.2010.02022.x. This page was last edited on 1 April 2019, at 11:19 (UTC).